Everyone I know, and possibly everyone I have met, is aware that comfort is not my priority in clothing. It is certainly something I consider; I wouldn’t inflict pain or unease on my body no matter how stylish an item of clothing or footwear might be, but it is an ‘also ran’ of my considerations. To begin with, living in the city precludes the need to base clothing choices on waging a permanent battle with the elements; secondly, comfort has a great deal to do with familiarity rather than an instantaneous feeling – I feel comfortable in clothing that I am used to that is also used to me. Thirdly, physical comfort is no more important than the psychological comfort of wearing something you feel good in; a down-filled puffa jacket would make me feel ridiculous, nullifying any physical effect it has on me. 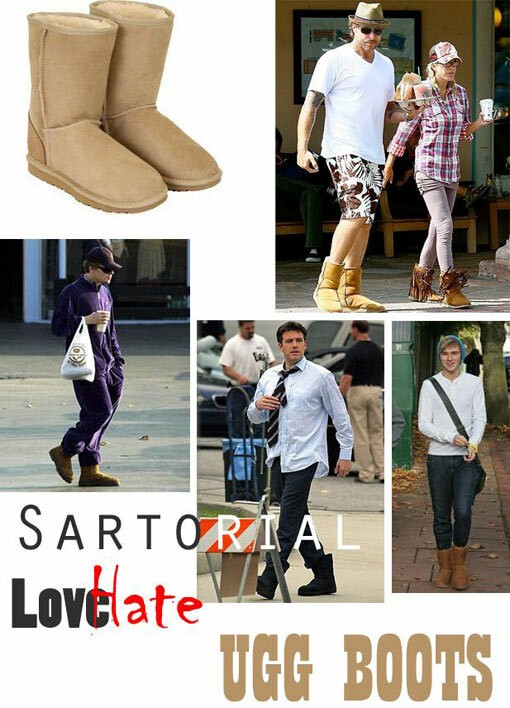 It should come as no surprise then that I heartily disapprove of a certain menswear craze; Ugg boots. The aptly named boots are a boil of fashion that requires an immediate lance-and-drain. They are inelegant, impractical and irritating. However, for every detractor there appears to be an advocate; “They’re SO comfortable though!” a friend said, with a hint of embarrassment in their quiet voice. Comfortable they probably are; sensible they are not. These iconic sheepskin boots, though a unisex item, were always seen as a female fashion trend, catalysed by celebrities such as Kate Hudson, Cameron Diaz and Paris Hilton who were pictured stumbling around Los Angeles boulevards, Starbucks in hand, bug-eyed sunglasses-on-head going from boutique to Bentley in unsightly, unstructured Australian farm-hand footwear. Since those days, they have been adopted by the slummy-Sloane set, street-corner teenagers and haggard, harsh-voiced pram-pushers; and now they are being worn by men. Good grief – if you think London is bad for the ubiquitous Uggie, try living in its Country Of Origin. *cringe* Talk about the stuff of nightmares. Such a useful shorthand for which people to avoid. The well dressed wouldn’t stand out as such without the poorly dressed also being amongst us. As the saying goes,”There needs be opposition in all things.” If everyone was fit, all my toil and sweating in the gym would go unnoticed. I suppose it’s the same in fashion. And yes, Uggs are incredibly ugly! They take the elegant human figure and transform the lower half into chunky plow horse legs (and that is not a pretty sight). However, I don’t suppose the makers of Uggs are crying all the way to the bank about it. Here in the States they are referred to as ” Thugs” as they are worn with baggy sweatpants or pajamas by the same. “But they’re so comfortable!” Really? And when is a well-fitting leather shoe particularly uncomfortable? And even if these wastes of good fleece are the most comfortable things to walk around in since the book of Genesis, is comfort really worth looking like such a tool? I cannot imagine going out in public wearing these things unless you have a bag over your head so no one will recognize you. They LOUDLY scream “I’m a complete slave to fashion merchandising and have no taste whatsoever!!! !” Jim is right: Ugg wearer = avoid. Myles is right.Bogan is the term for the wearer in their country of origin.The things you see when you don’t have a gun. I’d never seen a man wear such a thing out in public – until yesterday that is. A guy perusing the toothpaste in my local Tesco. The rest of his outfit wasn’t up to much either. tease. Also, to me it reminds me of a driver and its cover, but in a good way. And the cosiness they impart to the woman is pleasing, as is the scent it must surely create in the foot. In short, It can work, but only really on a woman and only when it’s very lack of style is used to its advantage. As a chap I can’t deny their comfort on cold mornings, but there is no current article of mens’ outdoor clothing that can accommodate their chunky stylessness, with the exception of meggings. These are even more controversial than uggs however, and the combination is best saved for those who eschew style and dignity, whether for a day or on a more permanent basis. For us chaps then, Uggs are at best a temporary pleasure before the foot dons leather shoes, at worst an abomination. God I hate UGG boots with a passion. I just can’t stand them, yes fair enough if it was snowing and they look the part. But more than not they are just sloppy looking boots and I just can’t stand them, along with office workers wearing trainers with their suit trousers. I have to admit I enjoy my Ugg slippers in the mornings before I am properly dressed. However, I don’t even venture to my mailbox in the hideous things.